Very nice hostel in a historical building in Le Marais! Two blocks away from the Seine and a quarter hour walk to the Centre Pompidou (along the way you'll find many thrift shops and nice little bistros). The place is really large, comfortable and well located. We went in the summer, the rooms were reasonably cool but there was no air conditioning or fans, that made it harder to sleep sometimes. It is not a party hotel. Rooms are divided by gender and you're not supposed to be loud, consume alcohol, etc. Location is great, central area with lots of bars, restaurants and cafes close to it. Walking distance from the Notre Dame cathedral. Staff is nice, facilities too. No Wi-Fi in the bedrooms and not enough sockets either, though. Its perfect! Everything is new and clean, the staff are very polite. The location are 30 min walking to Grand Place, a little bit far. The bar is good also! Dessa vez fiquei num quarto individual, tem o mesmo padrão do coletivo, banheiro compartilhado, mas o chuveiro é no quarto. Muita poeira, mas simplesmente amo a localização, me sinto super segura andando nos arredores mesmo depois da meia-noite. Café da manhã muito bom!!! Recomendo! Nice and beautiful hostel. I think they have 3 different buildings, all close eatch other. Breakfast incluided but it wasn’t a big thing. The room has a shower without soup or hair dryer and the toilet stay outside. 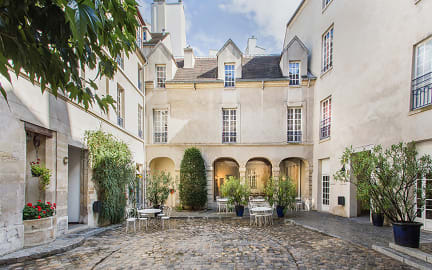 The location is good, 15min to Notre Dame and 25 to Musée du Louvre. I recommend this Hostel for sure. The worst hostel of my life. The woman that stays at night doesn’t speak English and is not polite at all. If you arrive in the night, they will keep your passaport with them ( helllo!!! This is crime!) and only give back in the next day. The internet doesn’t work in the bedrooms, the shower is discussing and very small, also very low. It’s far from the main points of the city and very expensive. Never again.